Canon EF-S 10-18mm f4.5-5.6 IS STM lens review: Can Canon’s budget wide-angle zoom compete with pricier offerings? Designed to accommodate the smaller APS-C sensors the new Canon 10-18mm f4.5-5.6 IS STM was announced alongside the full frame pro-oriented Canon EF16-35mm f4L IS USM. Unlike its pricier sibling this model is aimed at novices looking for a much wider option to the standard kits lenses, where it’s the equivalent of a 16-29mm. Besides the field of view at the wider-end this lens shares a few other features with the pricier full-frame model including four-stop optical image stabilization and a up-to-the-minute 14-element design with both UD and aspherical elements and the latest coatings to minimize hosting and flare. This lens also features a near-silent AF stepper-type motor specifically optimized for video recording although it can of course be used for stills, where the rear focus design provides fast focusing. 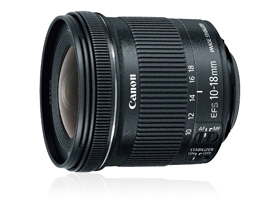 Minimum focus is closer than the existing $649 Canon EF-S 10-22mm at 8.66” (0.22m) and with a 67mm filter thread and measuring 2.94 x 2.83″ (74.6 x 72 mm) it’s a good deal smaller and much lighter at 8.47 oz (240 g) than that model. The Canon EF-S 10-18mm f4.5-5.6 IS STM is available now at $299. 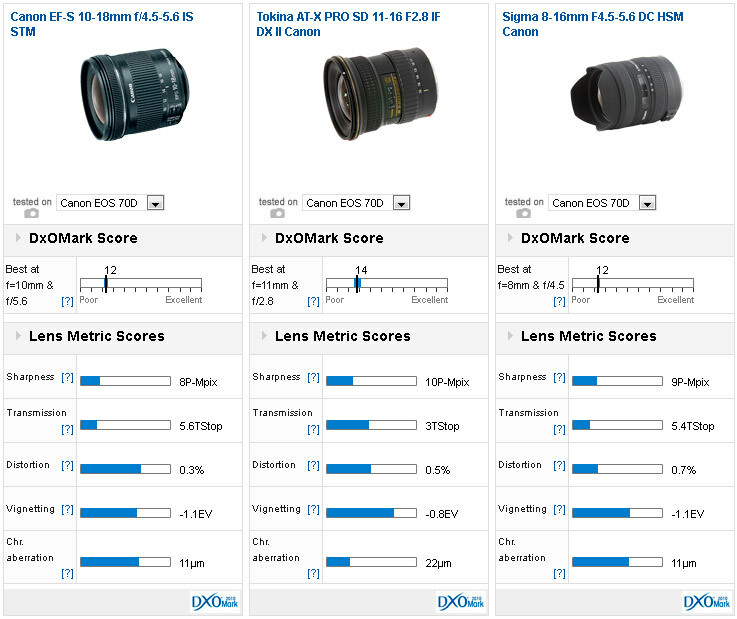 With a DxOMark lens score of 12 points the Canon EF-S 10-18mm f4.5-5.6 IS STM is a good but not great performer. A peak resolution of 8-Mpix on the 20.2-Mpix EOS 70D is a bit low even for a zoom like this, but distortion and vignetting are quite well-controlled. Lateral color suppression is really only average for a modern design however, given the performance is not far behind much pricier rivals it seems to be good value at least. Chromatic aberration correction is good but not great. 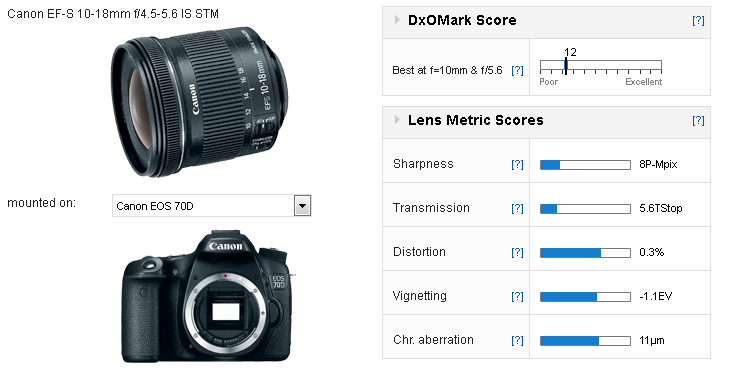 Measured on the Canon EOS 70D, the EF-S 10-18mm f4.5-5.6 IS STM is really only an average performer optically. At just $299 it’s accessibly priced and seemingly good value for money; being close the pricier EF-S 10-22mm f3.5-4.5 USM and ahead of the current (full-frame) Sigma 12-24mm f4.5-5.6 EX DG HSM II and now-discontinued Tamron 11-18mm. Against well-established and highly regarded rival models, such as the pro-level constant-aperture $659 Tokina 11-16mm f2.8 IF DX II and the extreme Sigma 8-16mm f4.5-5.6 DC HSM the new Canon doesn’t look too bad. 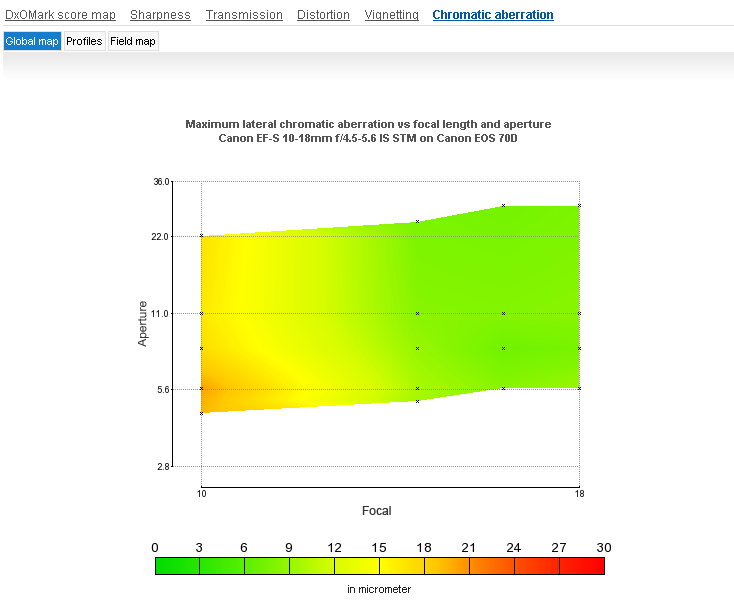 Peak resolution is just behind both and it has low levels of distortion and vignetting. 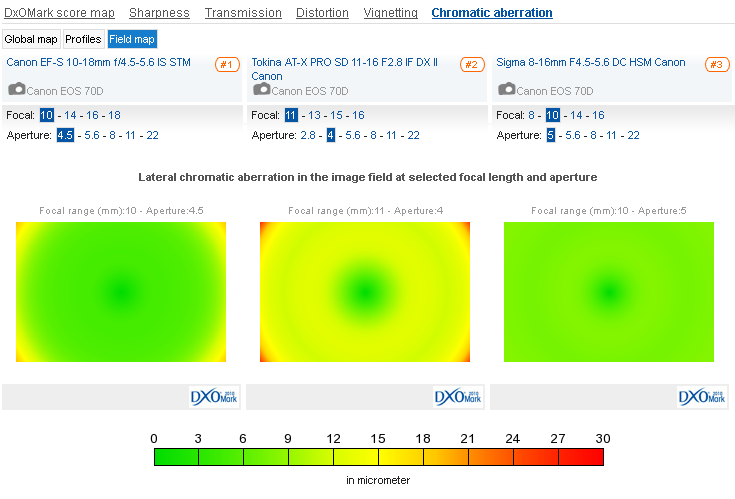 The wider Sigma has similar levels of chromatic aberration as the Canon, which in turn are both better controlled than the Tokina though that’s perhaps not surprising given the differences in their respective maximum aperture and focal length. These measurements are really just key performance indicators and so it’s worth a closer look at the data to see how well the Canon performs. At the wider-end of the zoom range the Canon has some CA in the corners but the faster Tokina is much more troubled while the Sigma at similar focal length is relatively free. For theprice the Canon performs well in this regard. 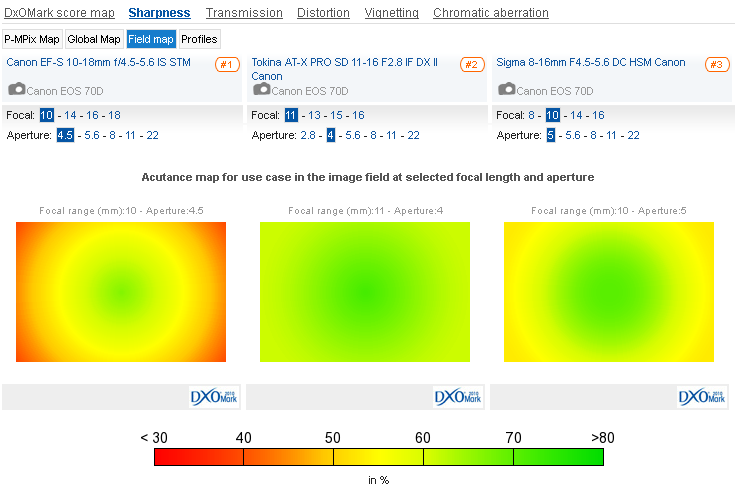 As for sharpness we can see that both rivals outperform the Canon at around the same aperture, though in fairness the performance at f5.6 is greatly improved. Sharpness in the center remains high but the gains made are mostly in the outer field, at least to the borders. There’s some slight softness in the corners but it’s a good result at that focal length. At longer lengths it’s not quite such an accomplished performance although sharpness is good centrally and mostly on a par with the Tokina and Sigma, and in some cases just ahead. This lens isn’t a replacement for the existing, near pro-level EF-S 10-22mm f3.5-4.5 USM; it doesn’t match the range, speed (or build-quality) but with a similar optical performance, lower price and quiet STM AF motor this lens certainly has its place in Canon’s line-up. Knowing it will appeal to both stills and budding moviemakers it’s likely to be a popular addition, but it doesn’t really plug any holes in the maker’s range.